Upper Delaware River Region, PA / NY (May 21, 2014) – The Delaware Highlands Conservancy has released a new short film about the inter-connectedness of our vibrant local community, our thriving farm and forest economies, and the ways in which shopping local—and utilizing the resource www.ShopLocalSaveLand.com, can make a big difference. View the video at www.ShopLocalSaveLand.com or www.DelawareHighlands.org. Produced in our Upper Delaware River region, the video features Keith Fitzpatrick (Hillside Woodworks), Larry Zampino (Zampino Arts), Emily Montgomery (Calkins Creamery), Andy and Kristin Curtis (Journey’s End Farm), and Pete Comstock (The Homestead School), and highlights the many ways in which supporting local businesses both connects us to the land and improves our quality of life. ShopLocalSaveLand.com is an easy-to-use, one-stop resource for finding local businesses and providers for farm and forest products in the Upper Delaware River region. This means consumers can easily find fresh, healthy, local foods, as well as local sources for building, decorating, and heating their homes. The whole community benefits when agricultural lands stay agricultural lands. Studies have shown that eating locally grown foods means eating healthier. 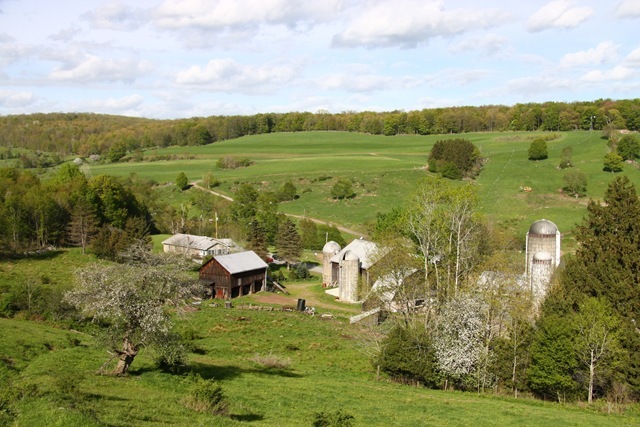 Hills of rolling farmlands add to the scenic beauty of the region and bring visitors here who support not only locally produced farm products, but other local businesses as well. This gives farmers the economic resources they need to maintain their farmlands as agricultural lands. Similarly, ShopLocalSaveLand.com creates a well-connected network of local wood products providers, forestry professionals, conservation organizations, and the general public to foster the sustainability of healthy and economically productive forestlands. The healthy forests of our region protect vital drinking water sources for us and for over 15 million people downstream. Supporting local forest products businesses means supporting our locally sustainable forest economy and assuring that our valuable forests will be here for future generations. The Shop Local Save Land video project was funded in part by a grant from the Pennsylvania Department of Conservation and Natural Resources, Bureau of Recreation and Conservation Community Conservation Partnerships Program administered through the Pennsylvania Environmental Council’s Pocono Forest & Waters Conservation Landscape Conservation Assistance Program. The Delaware Highlands Conservancy works in partnership with landowners and communities to protect the healthy lands and forests, clean waters, eagles and eagle habitat, locally sustainable economies, and quality of life in the Upper Delaware River region. For more information on the Conservancy and how it connects people to the lands where they live, work, and play, visit www.DelawareHighlands.org.